There was a time when I thought I would be a lifetime (Progressive) Conservative voter. I did not abandon my political principles even when most voters fled the once mighty PC party, reducing its representation to a mere two seats in Parliament. Let me tell you why I am not going to vote for you or your Party this year, and why I hope that you will be defeated in the upcoming election. No, I am not going to say anything nasty. I do not subscribe to the idea that those who think differently about politics must be declared enemies of the public. Let us leave American-style political hatemongering and demonization to, well, Americans. I disagree with your economic policies. Balancing the budget is a good idea… during good economic times. When the economy is in a rut, especially now when Canada is suffering more than it should from the impact of falling oil prices, government’s top priority should be re-igniting the economy and the creation of jobs. Not balancing budgets, especially not at a time when interest rates are at a historic low, and the debt-to-GDP ratio of the country is healthy. I disagree with your response to security challenges. 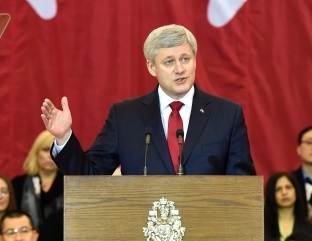 No, I do not underestimate the jihadi threat even to a peaceful country like Canada. But even as you proclaim that the jihadis are enemies of freedom, it’s your policies that represent a direct attack on our freedoms. You want to curtail our freedom of speech, when said speech amounts, in someone’s opinion, to “promoting terrorism”. You want to censor the Internet when it comes to content that is seen terrorist propaganda. You want to grant enhanced powers to agencies that already engage in alarmingly intrusive activities when it comes to our privacy. Yet the material impact of these measures is dubious. You also championed a regime of two-tier citizenship. So your response, which may either by misguided or (if done for the reasons of election-year politics) cynically calculating, amounts to a greater threat to our freedoms and basic rights than jihadi terrorism. I disagree with your populism, especially when it comes to science. I once (long before you became Prime Minister) wrote a concerned letter to the Chief Statistician, expressing my alarm about the extent to which private details may be revealed in personally identifiable form in the Long Form Census. But even I did not expect you to abolish this essential data-gathering tool. By doing so, you caused irreparable damage to Canada’s statistical data collection. Your populism trumped reason in other areas, too: federal scientists in Canada are muzzled like they have never been before. Your ban on travel from Ebola countries was done contrary to the best scientific advice. I also disagree with your policy on crime. I am sure this “tough on crime” agenda earns political brownie points in important constituencies, but hey, you can do better than that. You can be better than that. Canada does not need a tough-on-crime policy when crime rates have been consistently falling for the past several decades. We need to have fewer people in prison, not more. Archaic punishments like solitary confinement should be abolished, if possible. I could go on about other topics, including the sad state of the CBC, the future of Canada Post and the demise of home mail delivery, the Experimental Lakes, the closure of our embassy in Tehran, your ridiculous anti-prostitution bill, and more. Instead, let me just repeat a question well known from a past US election campaign: Are we better off than we were nine years ago, when you first came to power? I say no. While Canada’s economy weathered the storm of the financial crisis, that was largely a result of the policies of preceding governments. Since then, Canada’s economy never fully recovered and is lagging badly behind that of the United States. Our country is smaller-minded, pettier than it was nine years ago. Our international reputation is damaged. In short, Mr. Harper, I believe that despite your best intentions, you have been steering the country in the wrong direction. It is time to go. We have given you ample opportunity to show us what you can do, and you have not lived up to our expectations. It is time to give an opportunity to someone else, before your misguided governance results in more damage. However, if and when that happens, I will say goodbye by thanking you for your service, and I will hope others will do the same. Hate has no place in politics, and one of the best things Canada can do to improve its reputation is to show that it is possible, even in this 21st century, to be civil in politics. I am so done with tribalism. So frigging done. In recent days, weeks, months, I had many arguments with friends and acquaintances. Some assured me that they did not have a racist bone in their body, but that this or that minority (typically characterized by a darker skin color) is nonetheless inherently evil and should be dealt with accordingly. And repeatedly, they argued that the solution to war is more war; that the solution to violence is more violence; and that the answer to hate is more hate. Is this really the second decade of the 21st century? Nearly two thousand years after one man had been nailed to a tree for saying how great it would be to be nice to people for a change, have we still learned nothing from history? Sometimes, I am ashamed to be a member of the species that calls itself homo sapiens. I wonder if I should perhaps just give up and stick exclusively to cats when I pick my future friends. 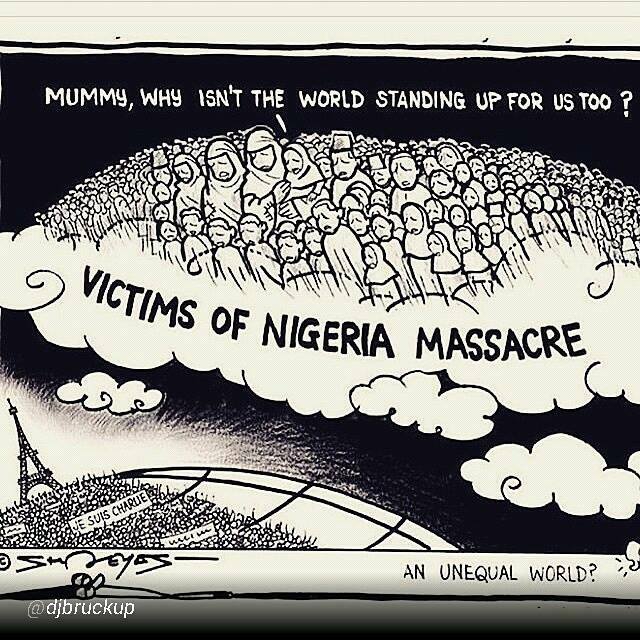 Tonight I came across yet another cartoon questioning what some see as Western hypocrisy, manifested in our response to the Charlie Hebdo massacre vs. the lack of a strong response to the massacre of civilians by Boko Haram in Nigeria. But it’s not hypocrisy. Part of it is pragmatism, part of it is something much worse. In contrast, when people from a foreign country, or people acting on behalf of a foreign power come to a Western city and go on to commit a politically motivated act of murderous terrorism, it is a direct attack on us. Our lives and our values. So yes, we respond en masse. We don’t expect people in India, China, or for that matter, Nigeria to carry signs with “je suis Charlie”, because it’s not their problem; it’s ours. But there is another problem. 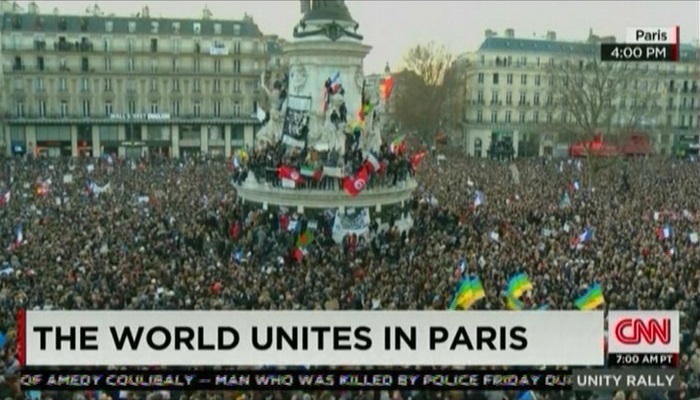 Both those praising and those questioning the response to Charlie Hebdo often speak of the “world”. But what is this “world” of which they speak? A few million people marched on the streets of Western Europe, with a population of some 400 million. 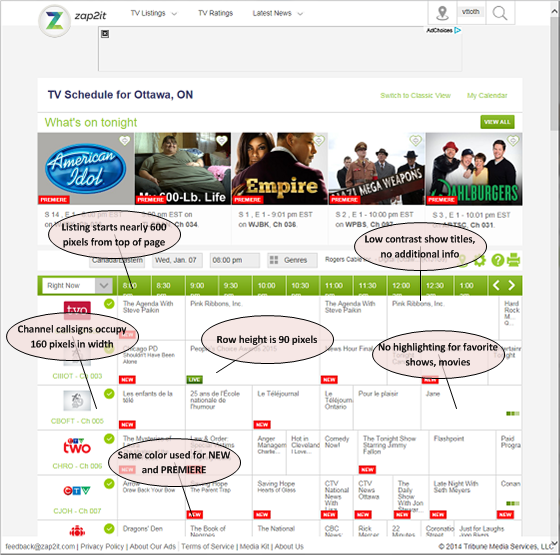 New organizations in North America, broadcasting to another 400 million people or so, made a big deal of this event. But… 800 million people is not the world. It’s barely more than 10% of the world. Was there any media outrage over Charlie Hebdo in China? Any large protests for the freedom of the press in India? Or any mass demonstrations elsewhere in Asia (population: 4.4 billion)? What about Africa (population, 1.1 billion)? Not that I’d expect them to be outraged. The attack clearly was not targeting them: it was targeting the West, and one of the West’s core values. Of course we are upset. But “we” are not the world. We are only a small part of it, and just because we have bigger guns and louder media outlets does not change this fact. All who are critical (or, for that matter, supportive) of the Charlie Hebdo reaction are well advised to keep this in mind. I am listening to Fareed Zakaria’s interview with former CIA director Leon Panetta. WTF? Saudi Arabia? Moderate? Are we talking about the same murderous thugs who think that beheading a woman on a public street is legitimate “justice”? 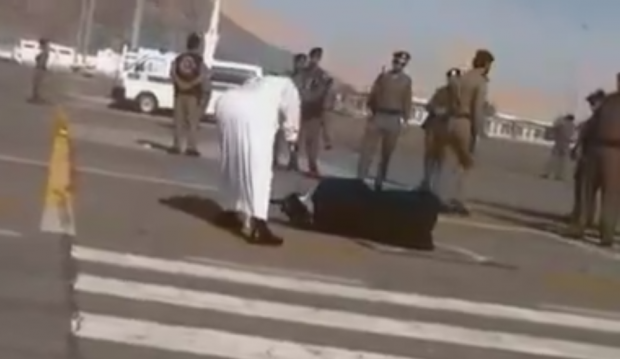 The same Saudi Arabia that already carried out 10 executions in 2015? Beagle 2 has been found. Beagle 2 was the British lander component of the European Space Agency’s Mars Express mission. It was supposed to land on Mars on Christmas Day, 2003; however, no radio signal was ever received from the spacecraft. Beagle 2 was considered lost, its fate unknown. But now, it has been found. 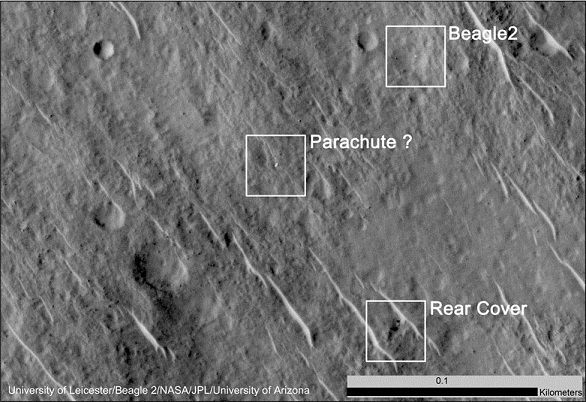 Beagle 2, together with its parachute and rear cover, have been spotted by the High Resolution Imaging Science Experiment (HiRISE) camera on board the Mars Reconnaissance Orbiter (MRO) spacecraft, which itself has been orbiting Mars since March 10, 2006. Imagine: a spacecraft orbiting another planet was able to spot an object barely more than a square meter in size, on that planet’s surface. I have enormous respect for the current pope, Pope Francis. This does not mean that I don’t disagree with him from time to time. I am certainly not into mocking other people’s religion gratuitously. What’s the point? 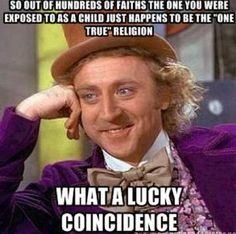 To prove that I am ever so smart that I don’t believe in their imaginary friends? To make them feel bad? However, I absolutely claim the right to mock. Just as I am willing to risk life and limb, if it ever comes to that, to defend other people’s right to their faith, I demand the right to ridicule said faith. And I expect nothing less from my more religious friends: they can mock my lack of faith all they want, but they should be willing to risk life and limb, if it comes to that, to defend my right to mock them. These are the core values of our Western liberal democracies, and there is no room for compromise, not even in the name of tolerance or political correctness. In any case… if your faith is strong, pure and genuine, surely some crass attempts to mock it will be ineffectual. 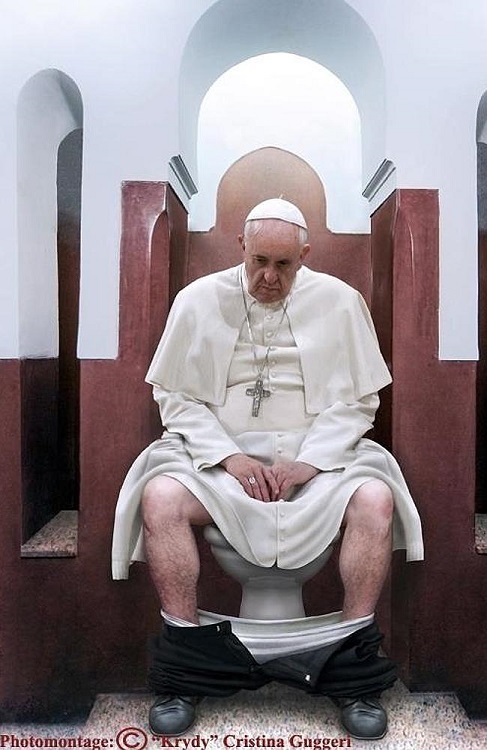 Just as my genuine respect for Pope Francis is not diminished by the digital art of Italian artist Cristina Guggeri. And just in case anyone thinks Guggeri was after Pope Francis in particular, that is not the case: she is an equal opportunity offender, she also portrayed Barack Obama and the Dalai Lama, among others, on the can. 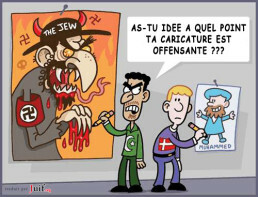 Some commentators, like Mehdi Hasan of the Huffington Post, accuse the world (in Mehdi’s words “free speech fundamentalists” in particular) of hypocrisy: we are defending Charlie Hebdo’s right to publish Mohammed cartoons, yet the same Charlie Hebdo fired a well-known cartoonist seven years ago for drawing a supposedly anti-Semitic cartoon. Well, but here is the rub: he was fired. Not murdered. Moreover, after he was fired, he filed a wrongful dismissal lawsuit and he won. And the editor (a close friend of former French president Sarkozy, who was the target of Siné’s supposedly anti-Semitic cartoons) lost his job. Had Charlie Hebdo fired a cartoonist or two for drawing anti-Islamic cartoons, nobody would have cared a damn other than the cartoonists themselves and their close circle of supporters or fans. 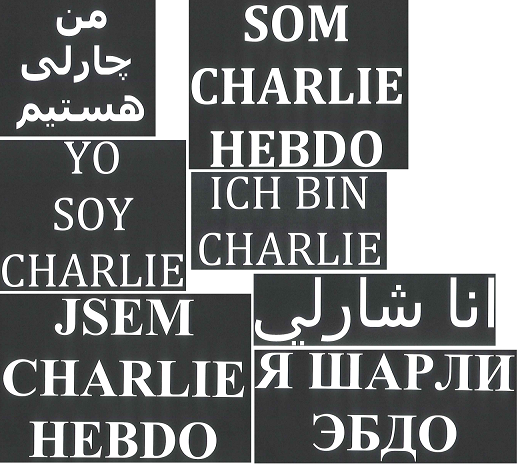 It’s not like Charlie Hebdo is a household name outside of France. Had some offended Muslims chosen to sue Charlie Hebdo in court accusing them of hate speech, they may have won; or they may have lost; but our core values would not have been threatened either way. The reason why we are upset is because members of Charlie Hebdo’s editorial staff (not to mention police officers, a maintenance worker, and last but not least, some Jewish shoppers halfway across town) were murdered in what was a direct, openly declared attack on one of our fundamental values: the right to freedom of expression, even when said expression offends someone else’s beliefs. 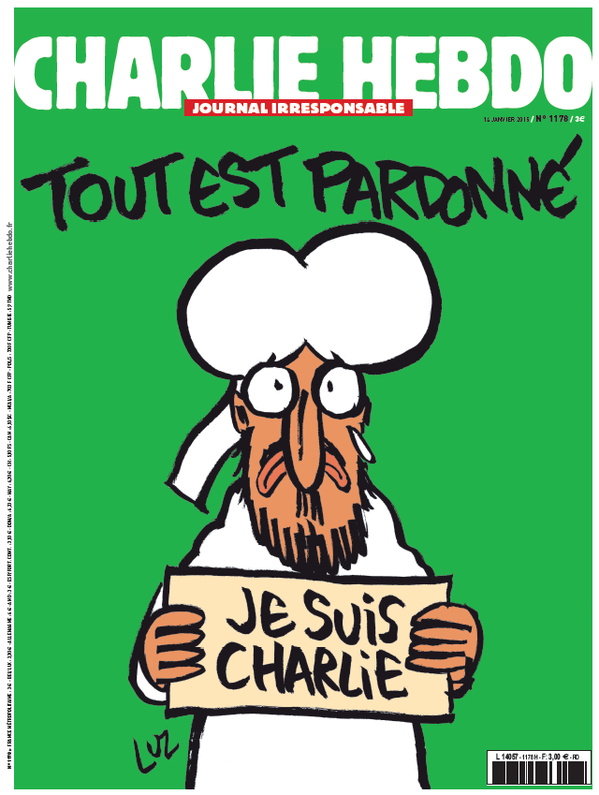 Meanwhile, I continue to be astonished by the cowardice of many Western media organizations when it comes to publishing tomorrow’s Charlie Hebdo cover. CNN at least were honest about it: Jeff Zucker basically said that they’re too afraid to do so. And speaking of hypocrisy, I just came across the illustrated transcript of Rush Limbaugh’s rant concerning CNN’s decision. A well illustrated transcript; it even has a stock image of some child on a sled. But, predictably, no Hebdo cover. To see the actual cover, you have to follow a link to another news organization’s Web site. Congrats, Rush, for showing us just what a brave and proudly courageous American you really are. In response to the Paris attacks, many supposedly responsible American politicians point at the US visa waiver regime as a potential threat to American security. “We cannot let these Europeans enter the country with no scrutiny,” they scream at the top of their lungs to an ignorant electorate that has been taught to see terrorist shadows everywhere. Meanwhile, talking heads on American TV also talk about how dangerous Europe has become, because of its open internal borders. I wonder if they would also advocate shutting down interstate borders within the United States. After all, there is no such thing as too much safety! And while they are at it, perhaps they can also institute random police identity checks, a mandatory national ID card system, and perhaps mandate that everyone must have a permanent address and a place of work. Oh wait, this has already been tried before. It was called communism. There is only one problem: they photoshopped out all the women. After all, an ultra-Orthodox Jew cannot maintain his sanity if he happened to see the face of a middle-aged female politician like Angela Merkel! This world is frighteningly full of idiots. He reportedly said this on live TV, and it wasn’t bleeped. I have a suspicion (make it a hope) that even among Muslims, few will find this cover offensive, especially in light of last week’s events. 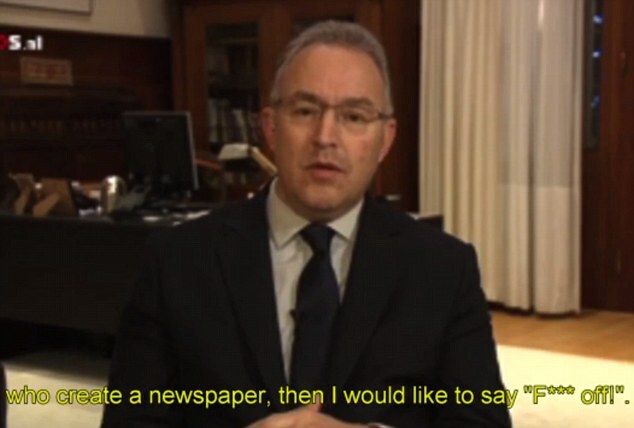 But even if I am wrong… I said it before and I will be saying it again: as a citizen of a liberal democracy, it is my fundamental right to ridicule other people’s beliefs. At the same time, it is my fundamental duty to defend, risking life and limb if it comes to that, the rights of other people to believe, no matter how ridiculous those beliefs appear to me. After all, Ahmed Merabet, the Muslim policeman who was first at the Charlie Hebdo scene, died defending the magazine’s right to ridicule his beliefs. 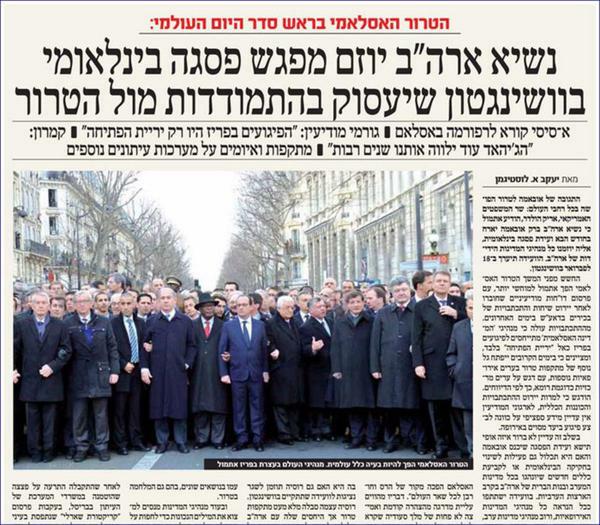 I guess this is not exactly what the murderers at Charlie Hebdo hoped to accomplish: a rally bringing together a million people or more, along with world leaders like Netanyahu and Abbas, marching together. It gives me hope that despite the best efforts of Islamists and Islamophobes alike, the world may remain sane, at least for the time being. 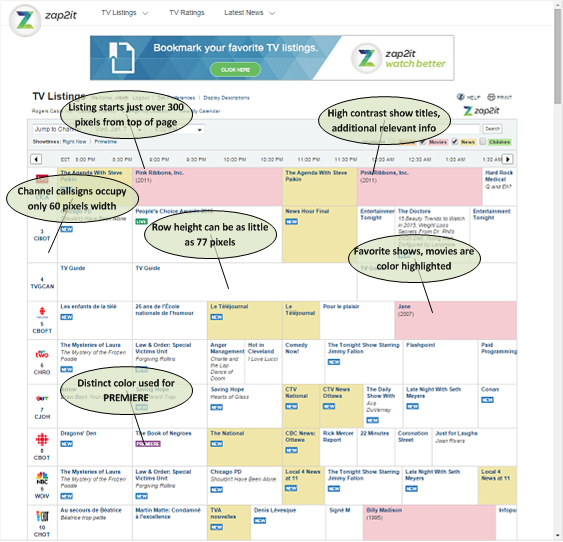 For years, I’ve been using the online TV guide provided by ZAP2IT to check what’s on TV. Generally speaking, I’ve been satisfied with their service. Until last year, when they introduced a whole new layout. Which, in my considered opinion, was a significant downgrade (makes me wonder if they were perhaps inspired by Windows 8). Today I noticed, to my considerable pleasure, that the old layout is back. I now have the option to “Switch to Classic View”. Which I promptly did, without hesitation and with no plans to change my mind. So much easier to view! So much easier to find things of interest! When they switched to the new format, I wrote an e-mail to complain. I did not expect a meaningful response. Noticing the link today, inviting me to switch back to the old format, was a most pleasant New Year’s surprise. I wrote to them again, thanking them for making the old format available. I hope it stays that way. Cartoonists are frustrated. Muslims are frustrated. 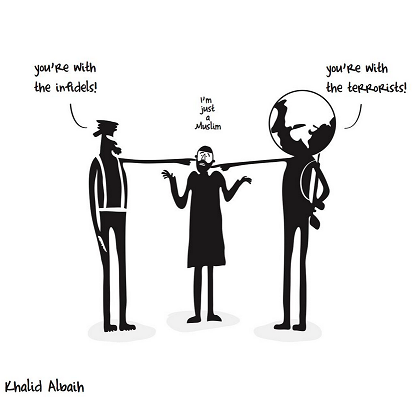 A collection of fresh cartoons express the frustration of a world, hijacked today by extremism. Here are two that illustrate these feelings most profoundly. 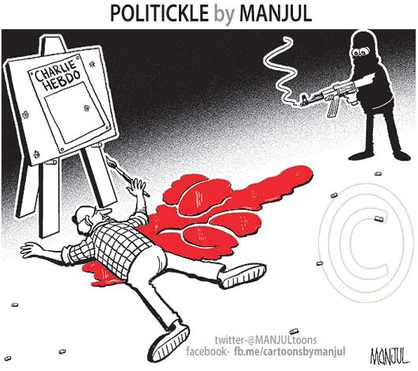 Thank you and all other cartoonists for not letting yourselves be intimidated by murderers. I just hope that the rest of us have the courage not to blame all Muslims for the crimes of a demented few. Kind of funny, by the way, in the wake of the SONY/The Interview farce how there is a common theme between religious zealots and atheist despots: they both hate humor and freedom of expression. It expresses the way I feel better than any words I could come up with on my own. At the root of the incident is a characteristic issue with these types of Soviet era nuclear reactors leading to magnetite contamination of the fuel elements and control rods. To deal with this contamination and prolong the life of fuel elements, cleaning ponds are installed next to the reactor blocks, where under roughly 30 feet of water, in a specially designed cleaning tank, fuel bundles can be cleaned. As the problem of contamination became increasingly acute, the power plant ordered a new type of cleaning tank. On April 10, 2003, this cleaning tank was used for the first time on fuel bundles that were freshly removed from the reactor. The cleaning of the fuel bundles was completed successfully by 5 PM in the afternoon; however, the crane that was supposed to replace the fuel bundle in the reactor was used for another task and was not going to be available before midnight. The situation was complicated by language issues, as the technicians attending the new cleaning tank were from Germany and could not speak Hungarian. Nonetheless, the German crew assured the plant’s management that the delay would not represent a problem and that cooling of the fuel bundle inside the cleaning tank was adequate. Shortly before 10 PM, an alarm system detected increased radiation and noble gas levels in the hall housing the cleaning pond. Acting upon the suspicion that a fuel rod assembly was leaking (the German crew suggested that the fuel bundles may have been incorrectly placed in the cleaning tank) the crew proceeded with a plan to open the cleaning tank. When the lid of the cleaning vessel was unlocked, a large steam bubble was released, and radiation levels spiked. Indeed, the crane operator received a significant dose of radiation contamination on his face and arms. The hall was immediately evacuated and its ventilation system was turned on. However, as the system had no adequate filtering systems installed (despite a regulation that six years prior mandated their installation) some radiation was released into the environment. As it turns out, the culprit was the new type of cleaning tank. A model that, incidentally, was approved using an expedited process, due to the urgency of the situation at the power plant. The fact that the supplier was a proven entity also contributed to a degree of complacency. Both the new and the old tank had a built-in pump that circulated water and kept the fuel bundle cool. However, in the old tank, the water inlet was at the bottom, whereas the outlet was near the top. 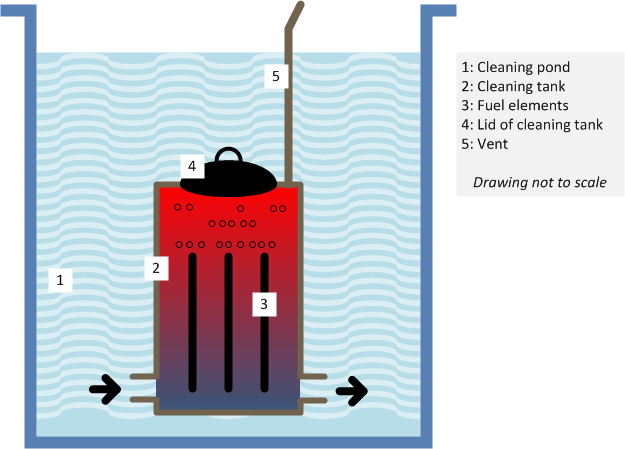 This was not the case in the new tank: both inlet and outlet were located at the bottom, which allowed the formation of steam inside the cleaning vessel near the top. Combined with the lack of instrumentation, and considering that the fuel bundle released as much as 350 kW of heat, this was a disaster in the making. And that is exactly what happened: due to the delay with the crane, there was enough time for the heat from the fuel bundle to cause most of the water inside the vessel to turn into steam, and the fuel elements heated to 1,000 degrees Centigrade. This caused their insulation to crack, which led to the initial detection of increased radiation levels. When the cleaning tank’s lid was opened, a large bubble of steam was released, while cold water rushed in causing a minor steam explosion and breaking up the fuel elements inside, contaminating the entire pond. It took another ten years before the last remaining pieces of broken-up fuel elements were removed from the power plant, taken by train through Ukraine to a reprocessing plant in Russia. The total cost of the incident was in the $100 million range. As nuclear incidents go, Paks was by no means among the scariest: after all, no lives were lost, there was only one person somewhat contaminated, and there was negligible environmental damage. This was no Chernobyl, Fukushima or Three Mile Island. There was some economic fallout, as this reactor block remained inoperative for about a year, but that was it. Nonetheless, this incident is yet another example how inattention by regulatory agencies, carelessness, or failure to adhere to regulations can lead to catastrophic accidents. Despite its reputation, nuclear power remains one of the safest (and cleanest!) ways to generate electricity but, as engineers are fond of saying, there are no safeguards against human stupidity. 2014 was not necessarily my favorite year. But it could have been worse. I had some interesting projects. I traveled to places that I have never been to. We lost a beloved cat, but then we were adopted by another. The world became a somewhat scarier place, but so far, it’s still holding together. And we’re alive, in good health. What do I expect from 2015? I have some project concepts. As I still have to work for a living, I hope some of them will work out. I have some research ideas. I hope I will have more time this year to work on physics. As for the world, hopefully sanity will prevail. In 2014, we celebrated the 100th anniversary of the Great War (to end all wars) in relative peace and prosperity. Hopefully, we will be able to celebrate the 100th anniversary of the Armistice the same way in 2018. These year numbers, by the way… I will never be able to shake off the feeling that they are surreal. When I was growing up, “1999” was the year of Moonbase Alpha. “The Year 2000” was synonymous with the distant future. “2001” was about a Space Odyssey. Then there was “2010”, the Second Odyssey, but that’s about it… beyond 2010, it was all vague, a future as distant as the days of the dinosaurs in the past. And yet, it’s 2015. Weird.